Map of Poundbury Camp. Fig. 1, Lewis 2011. 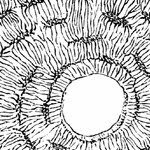 In the first ever issue of the International Journal of Paleopathology (which is dated March but didn't show up online until fairly recently), Mary Lewis discusses the evidence of tuberculosis in the skeletons of children from the Romano-British camp at Poundbury (Dorset, England). Originally an Iron Age hillfort, in the Roman period (3rd-4th c AD), Poundbury Camp was the main burial site for people living in Durnovaria (modern Dorchester). * It is unclear what kind of environment people lived in at Durnovaria, such as conditions in the small urban settlement, kind of food consumed, and prevalence of diseases. Previous work by Lewis established that the children buried in this settlement were subjected to poor living conditions and malnutrition, as seen in the high frequencies of cribra orbitalia, porotic hyperostosis, rickets, and scurvy. 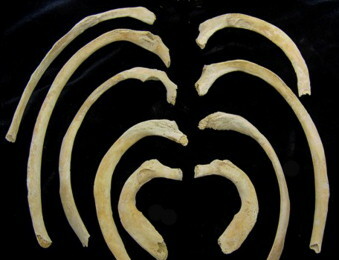 surface of the ribs. Fig 5, Lewis 2011. For this study, Lewis investigated a sample of 165 subadults (individuals under the age of 17, the approximate age of biological maturity) for evidence of tuberculosis. While tuberculosis is fairly well-known in the palaeopathological literature, only two cases of TB in children have been published in ancient Britain (with an additional 14 possible cases). Ten subadults were found with probable tuberculid lesions, or about 6% of the population studied, although three of these could have had brucellosis which, like TB, is an infectious disease linked to animal domestication. The presence of TB in children leads Lewis to conclude that the incidence in the adult population was probably higher, as children tend to get TB from adults and also tend to grow up to become adults with TB (if they survive, of course). Whether the percentage of subadults with TB is 6% or 4%, this frequency is much higher than expected for Romano-British Poundbury. The presence of TB in children in this sample suggests that people were living close together, and perhaps close to their animals as well. Lewis concludes by suggesting that TB may well have been endemic in this population. Mmm, tasty human. Grouper likee. If you're a regular reader, you know that one of my research areas is the diet of Imperial Romans. 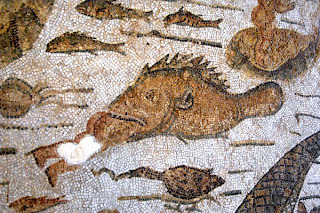 To that end, I've written quite often on this blog about the use and consumption of aquatic resources in the Roman world: Weaning and Freshwater Fish Consumption in Roman Britain and Bioarchaeology of Roman Seafood Consumption. Although not technically Roman bioarchaeology, a press release this week mentioned a Stanford researcher who looked to Roman art to study issues of marine conservation. Based on depictions of dusky groupers in hundreds of Etruscan, Greek, and Roman artworks, researchers have concluded that the species should be much larger and should be found in more shallow waters than it is today. Of course, artistic depictions are not always true to life, but the preponderance of depictions of groupers as very large fish leads the researchers to conclude that today's 50- to 60-cm groupers are much smaller than they were in the past. Further, Pliny and Ovid mention fishing for groupers from the shore, a practice that wouldn't work in modern times because groupers range in much deeper waters today. The grouper population today seems to be shrinking, and researchers want to prevent people from fishing for them, in order to restore the population and prevent extinction. I find it quite interesting that ancient mosaics have proven useful to conservation biologists. In terms of diet, we need to think about what the aquatic species looked like in the past. If groupers were large, tasty, and easy to catch, Romans may have eaten their fair share. 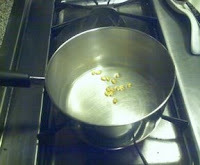 Assumptions about the kinds of aquatic resources consumed based on contemporary fish populations may therefore be wrong. A brief bit of news notes the discovery of a cemetery dated to 30AD in Epiedes-en-Beauce, in Loiret (north-central France). Within a square enclosure, archaeologists found weapons, jewelry, and pottery, leading them to think the area was religious in nature. 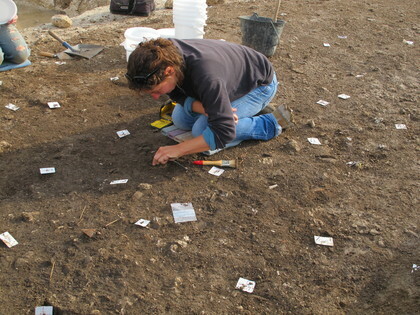 But they also found burned ceramics, remnants of funerary meals, nails, and human and animal bone, suggesting it was a cemetery or other funerary area. The abundance of material remains may indicate a high-status burial or burials. The remains are currently being analyzed in the laboratory, so there is no additional information yet. This discovery could be interesting, but I suspect that lots of little Roman-era burial sites are uncovered in France and other parts of the Empire. Depending on the condition of the bones and teeth and the number of individuals recovered, though, the human remains could form a nice little dataset for understanding life in rural Gaul. Well, hopefully in another two weeks' time, I'll have some more interesting Roman bioarchaeology news for you! * See also news from the 1st Roman Bioarch carnival, on a child skeleton found at Durnovaria. M.E. Lewis (2011). Tuberculosis in the non-adults from Romano-British Poundbury Camp, Dorset, England. International Journal of Paleopathology, 1 (1), 12-23. DOI : 10.1016/j.ijpp.2011.02.002.